Our 27th location opened this week in the North Loop neighborhood of Minneapolis Minnesota! On Monday, February 4th we opened our doors downtown to the only dry cleaner in the area to offer 24 hour pick up & drop off with our automated kiosk! 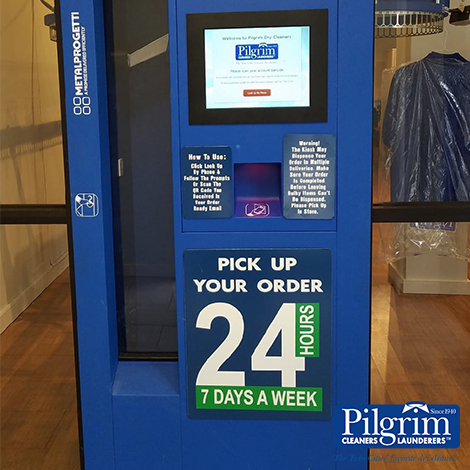 You can pick up your order 24/7 for your convenience with this machine that works similar to a red box that dispenses your clothes. Secured entrance to the building after hours can be accessed with your order ready email, our mobile app PilgrimGO or your express bag tag. This location also offers on-site wash & fold laundry service that lets you save time by not having to do your own laundry at home! You can skip the hassle of bringing in your clothes by requesting a free home pickup by signing up for our home & office pickup & delivery service here. For a limited time, our new store will offer 50% off all dry cleaning & laundry! Visit us in stores at our new location at 206 N 1st Ave Minneapolis, MN 55401.